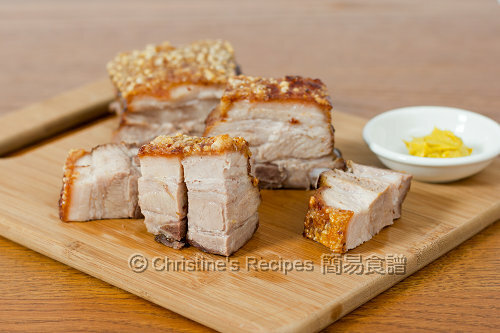 Both my hubby and father are big fans of crispy roast pork belly, sold from Hong Kong bake shops. So I decided to learn how to make some not long after I moved here. Lucky me, I know a couple who are very talented and have a passion in Cantonese cuisine. As they were afraid that they had to say goodbye to all their most favourite Hong Kong dishes after migrating to Australia, they nearly attended every culinary class taught by professional chefs, and learned all famous, traditional dishes, including roast pork belly (aka siu yuk, 脆皮燒肉). The tricks of roasting pork belly with a perfect, crispy crackling are quite simple. I had a big success at the first attempt. The crackling and the moist, juicy pork meat were so good, just like those bought from shops. But after a few more tries, I stopped making any more. Why? Cleaning up a greasy and messy oven is not enjoyable at all. Frankly, it’s like a nightmare to me. A few aftermaths have put me off for many years since then. Until recently, many of my friends started talking about and using convection ovens. Good reports from them after many tried. 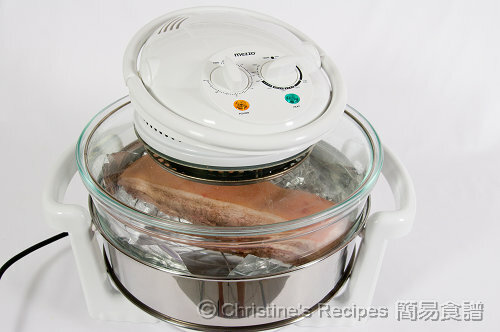 So I gathered all my courage and used my new kitchen toy – convection oven to roast pork belly again. The verdict: we’re satisfied with the end results. Best of all, the cleaning job is far less fussy. For poking pork rind, as I don't have the special tool - The "Pig Sticker" shown on Adam Liaw's blog. Instead, I used several roasting needles and tied by a rubber band. Poke the rind with this DIY utensil. To prepare the seasonings: Combine salt with sugar and five-spice powder well. Set aside. Use a knife to scrape away any impurities and hair. Rinse thoroughly. Blanch in boiling water for about 15 minutes, until 60 to 70% done, and the skin is softened. Drain well and wipe dry with paper towels.. Use needles to poke the rind as many holes as possible. Turn over to other side, cut a few slits on the meat to help absorb seasonings better. Rub wine evenly on pork. Let rest for a while. Coat the meat with seasonings evenly. Make sure there‘s no seasonings on the rind, otherwise the five-spice powder will darken it. 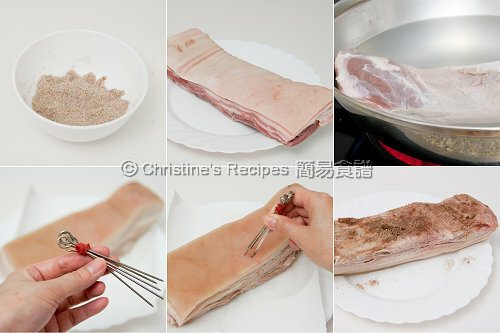 Wrap the pork meat with foil and leave the rind unwrapped. Place in fridge, let air dry overnight in fridge. Fatty stuff released while roasting, caught by the foil at bottom. The juicy, moist pork meat turned to be much healthier. The tricks of making crispy cracklings: First, the rind must be very dry. (Remark: Some of my friends/fans tried brushing some vinegar, about 1 tablespoon, on the rind just before baking. It helps the rind dry up a bit more while baking.) Second, poke as many holes as possible. While grilling, the fat inside the rind turns really hot, then get released from the holes. That produces an effect of a kind of “frying” the rind. So, it turns crispy. Mind you, don’t poke too deep through the rind though. The rind won’t be crispy any more otherwise. 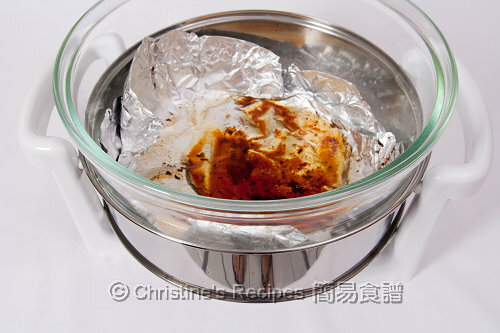 Basically, the temperature is the same, no matter you use convection oven or ordinary one. But an ordinary oven needs longer cooking time. The cooking time depends on how thick and how big the pork belly is. Please adjust accordingly. I LOVE siu yuk! The skin on yours look so crispy and delicious YUMMY thanks for this recipe! Oh wow... looks good! I never touched siu yuk until I got pregnant with my 1st child 2 years ago... I started craving for it and hubby was surprised to see me requesting for siu yuk as well.. even now, with 2nd child on the way, I am still liking it! WAH the skin looks so crispy! I tried making once and the skin came out chewy =( mus try again! Scrumptious, your pork belly looks picture perfect! simply incredible! Your 燒肉 looks crispy and not too fatty, they look better than the ones I bought. 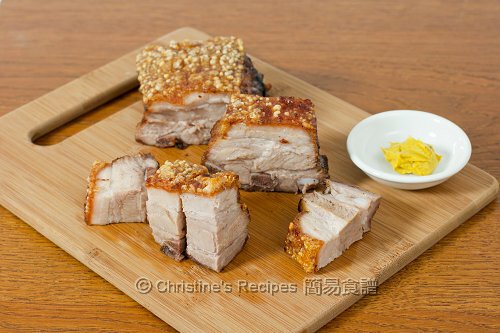 I love crispy roast pork belly, but have never tried to make this myself. I am surprised the recipe sounds very simple...! Thank you for sharing, Christine :). I've never used convection oven before but now I want to get one just to try this recipe. Though I guess I can try it without it, but I don't like messy clean up either. My family loves crispy roast pork belly. I am very tempted to make this. Looks perfect! The crackling crispy pork belly....yum yum! Feel like a plate of siu yok rice right now! hi, i would very much like to try to make my own siu yuk, your version sounds much simpler and they look very good in the picture! Thanks for the tip! Definitely be making this as well. A personal family favourite. Crispy skin and moist inside... I would love some!! Looks and sounds amazing. I am going to have to try this when I get a fee moment. You have me inspired. Hi Christine, I had a look at the ingredients and the methods, but I can't find the rock sugar you mentioned in the ingredients when you said to mix salt with sugar and five spice powder. Is the sugar used supposed to be 3 teaspoon or for taste only? I'm thinking of making this tomorrow, so hope to hear from you soon. Sorry for missing your comment before. I've updated the recipe. It should be clearer. Hope it helps. Thanks Christine! I can't wait to taste this after it's done! Looks amazing! what kind of convection oven is that? does it have light? seems like the ones w/o light would not give the crispy finish. No, mine hasn't got light with it, but it works for me. The crackling was great and crunchy. It's all about the method of how to bake and grill the rind. This dish is popular here in our country, but I never tried poking it to make it crisp. This I would like to try out. can you tell me what brand is the convection oven ? No problem. The brand is called "Mezzo", bought it here. By the way, your recipe is similar to mine but mine have additional spices (garlic powder). I have another recipe uses 5 spices powder, garlic powder and "sha kiong powder". So far have not tried. But this recipe was given by an executive chef in a restaurant in HK. 看了真想吃. Read in one of the comments on your Chinese site that you have a English site! I had to come take a look! Great stuff! Keep up the good work! Great post! I love you new conventional oven! :) Looks good! Oh, if you try the chef's recipe, please let me know how it goes. Email me if you like. Thanks for dropping by. Welcome you ! I've made this recipe twice. My wife loves it! I use the Sharper Image convection, infrared, halogen oven. I brush chile oil on the skin and sprinkle with course kosher salt before placing it in the oven. AWESOME! 1) if you have an electric fan oven, rind will never crispy up perfectly during the baking processing. You need to finish it under the grill for a really crispy crackling. 2) in a gas oven, the rind will crisp up nicely provided the temperature is right. I have similar baking toy machine like yours and it turned out perfect. I bought 2 pcs of ready sliced pork belly, blanched and marinade according to your receipe. The skin was crispy and taste is excellent. You can use soy sauce with dash of white pepper as dipping sauce if needed.